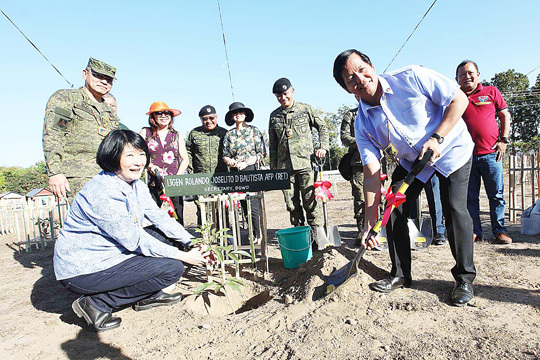 Isa Cojuangco Suntay (left), Tarlac Heritage Foundation co-Founder, and Social Welfare Secretary Rolando Joselito D. Bautista (right) flank a sapling as they lead the ceremonial planting during the launching of ‘Hardin ng Lunas: Food, Wood, and Income Project’ at the rolling hills of the 3rd Mechanized (Makatarungan) Infantry Battalion area in San Jose, Tarlac on Tuesday. Joining them (from left) are Brig. Gen. Henry Robinson, commander of the 702nd BDE in Manaoag; Tony Cortes of Corvill Agricom; Belinda Robinson; Lt. Col. Ramon Antonio Bello, commander of the 3Mech Bn; Mrs. Faith Bello; and Brig. Gen. Bismarck D. Soliva, Acting Commander, Mech Division of the Philippine Army.